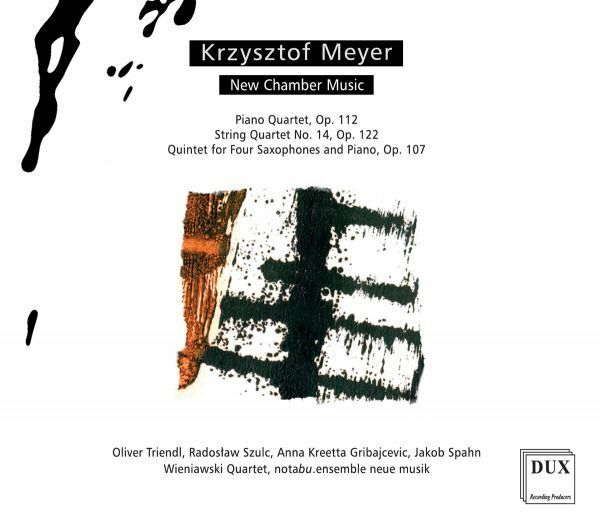 Krzysztof Meyer New Chamber Music - Good start for polish music. The recording from the series dedicated to Krzysztof Meyer’s works includes his most recent chamber pieces. Born in 1943, during over 56 years of artistic work, the composer has developed an original style, combining modern means of expression and the intellectual character of the form with the traditionally understood musical narration influencing the audience’s emotions. Three sound performances featured on the present CD are an excellent example of this style. The virtuoso Piano Quartet abounds in contrasts and changes, the lyrical String Quartet is much more calm in comparison with the previous piece; the expressive culmination is brought by the Quintet for four saxophones and piano, which unexpectedly refers to Bach’s choral in its last bars.